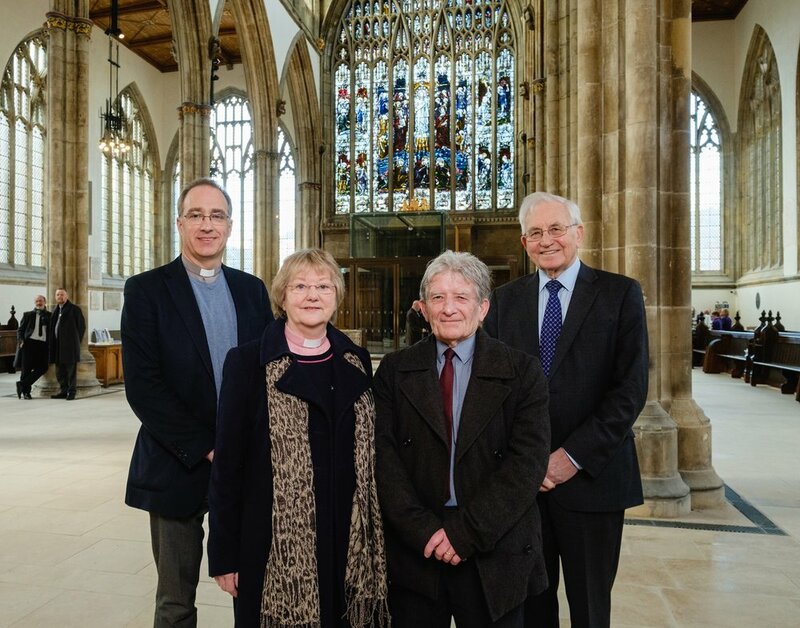 Pictured in Hull Minster’s remodelled Nave are, from left, Vicar Neal Barnes, Associate Vicar Irene Wilson, Hull City Council Leader Cllr Steve Brady and Hull Minster Development Trust Chair John Robinson. Hull Minster has re-opened fully to the public after more than two years of works that have transformed the city’s most amazing place. Hull City Council Leader Councillor Steve Brady and the Vicar of Hull Minster, the Reverend Canon Dr Neal Barnes, performed the ceremonial re-opening of the great West Doors to reveal remarkable changes – the most extensive for more than 170 years – that have rejuvenated the magnificent church. The Minster has now become a flexible space for worship and use for cultural, artistic, community and corporate events, effectively creating a spectacular and unique new venue within the church’s 700-year-old walls. The most dramatic change has seen the centre of the Nave cleared of the crowded pews introduced by the Victorians to create an awe-inspiring and flexible place for worship, as well as to host a wide variety of events, including music concerts with a capacity of up to 650 and grand banquets seating more than 300. A new heating system beneath a beautiful limestone floor and the thorough reconditioning of Victorian radiators has also created a warm and comfortable environment within the church for the first time in decades. State-of-the-art lighting and audio visual facilities have also been installed to make the Minster a superb and unique venue for events and performances, supporting the sustainability of the church and its good work in the community. Meanwhile, the pews removed from the central part of the Nave have been shortened and reinstalled in rows at the side of the church or made moveable on raised platforms or on castors, so they can be wheeled in or out as appropriate for services and to accommodate larger-scale events. When not in use in the Nave, many of the movable pews form a new chapel in the North Choir Aisle, featuring an ornate communion table which has not been used since the 1840s. Following the ceremonial re-opening, Cllr Brady invited the Lord Mayor of Hull, Councillor John Hewitt, to be the first to enter the transformed church through the West Doors, followed by members of the congregation, civic and community leaders and supporters of the Hull Minster development project. The Lord Mayor of Hull, Councillor John Hewitt, became the first person to enter following the re-opening of Hull Minster’s West Doors by city council Leader Steve Brady and Vicar Neal Barnes. The guests entered via a spectacular new glazed internal entrance which offers magnificent views from Trinity Square right through to the stained glass window at the east end of the church. Guests were then taken on guided tours of the church, highlighting the key changes and new facilities, and heard how the physical rejuvenation is supporting Hull Minster’s vital work with some of the most isolated and vulnerable members of the community. Dr Barnes said: “This is a truly historic day for Hull Minster and the city of Hull. After more than two years of works, inside and out, we can now re-open fully to the public and once more welcome the community in through the West Doors. “We’re sure people will share our appreciation of the extraordinary transformation that has taken place. “This building has always been a magnificent and beautiful place, but it has now been given a new lease of life, with new space and light and so many fresh opportunities. It’s now an even more amazing place for everyone to worship, enjoy, explore and belong. Cllr Brady was invited to perform the re-opening in recognition of the importance of Hull Minster’s transformation to the regeneration of Hull and the strong partnership between the Hull Minster Development Project and the city council. Cllr Brady said: “I am delighted to be have been invited to re-open the stunning great West Doors on this momentous day for Hull Minster. “The investment into Hull Minster reflects the incredible transformation of the city centre’s public realm and key cultural venues, and is a testament to the Minster’s commitment to the future of Hull. Guests enjoy the space and light within Hull Minster’s Nave, now cleared of the crowded pews introduced by the Victorians. So far £3.5m has been raised towards the £4.5m target to deliver the Hull Minster transformation project in full, with funds coming from private individuals, local companies, trusts and grants. The internal works have been delivered by principal contractor, Hull-based construction company Houltons, supported by a number of specialists, including architectural joinery business Houghtons of York, which carried out the remodelling of the pews. Hull Minster Development Trust Chair John Robinson thanked all those who had made the remarkable changes possible and urged continuing support to complete the development project. He said: “Hull Minster is a priceless asset for our city and region but one that, not too long ago, was neglected and facing a perilous future. The great doors we have entered through could have closed forever. Now they are open again and a new chapter has begun. “By a comparatively modest investment the Minster has been much more than just preserved, it is becoming what it was always intended to be – a true hub for the community, fit for purpose today and for generations to come. “This is a landmark moment, but there is still much to be done to unlock the full potential of this wonderful place. We still need financial support – there are still bills to pay for this part of the project and we want to move on as quickly as we can to the third and final phase. The transformation of Hull Minster is being delivered in three phases. Phase one saw the churchyard become part of the refurbished Trinity Square, creating an open and welcoming entrance to the Minster, while phase two was focused primarily on the re-modelling and renovation of the Nave. The final phase of Hull Minster’s remarkable rejuvenation will include the creation of a new high-quality café, partly within a glazed extension of the south west corner of the church, and newly curated and displayed heritage exhibitions celebrating and commemorating the intertwined history of the church and city. Despite the disruption caused by the internal works, more than 70,000 people visited Hull Minster in 2017, three times the number just two years earlier. This year Hull Minster hopes to welcome even more people through its doors as the revitalised church attracts an ever-growing number of events and gatherings.